Kimber Kable understands that a turntable is an extension of the audiophile's commitment to musical enjoyment. TAK™ preserves all the precious detail that can be extracted from vinyl. radio frequency interference and crosstalk. Proprietary shielding material drastically reduces low frequency hum. 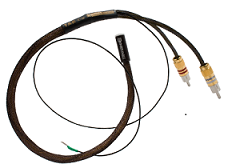 Standard terminations are high quality 5-pin DIN to RCA or XLR. Other termination options are available on request.